This week we take a look at the TRX suspension trainer and how it can be used to build Strength, Flexibility and Balance. TRX Suspension Training gives participants an edge over conventional strength training because every Suspension Training exercise builds functional strength, improves flexibility, balance and core stability all at once as is required on sporting fields and everyday life. The training movements are distinguished from traditional gym exercises in that either the user’s hands or feet are supported by a single anchor point while the opposite end of the body is in contact with the ground. Using the TRX, the desired percentage of body weight is loaded onto the targeted body zone and animated as an exercise movement. The TRX Suspension Trainer was develpoed in the USA by Navy SEALS on operations and is now used as a effective training tool for a anyone regardless of age, gender or fitness level up to elite athlete’s. The benefits of Suspension Training are not just applicable to athletes, they are relevant for everyone who seeks a method to safely and rapidly improve their fitness. Senior wellness programs have turned to TRX as a solution because it enables seniors to move freely without fear of falling. Physical therapists are using the TRX to rehabilitate patients. The newest addition to the TRX family is the TRX Rip Trainer. The TRX Rip Trainer develops explosive power and rotational movements. By using the TRX Rip Trainer, individuals can strengthen the muscles around the spinal cord, making them more stable and less likely to be easily injured. 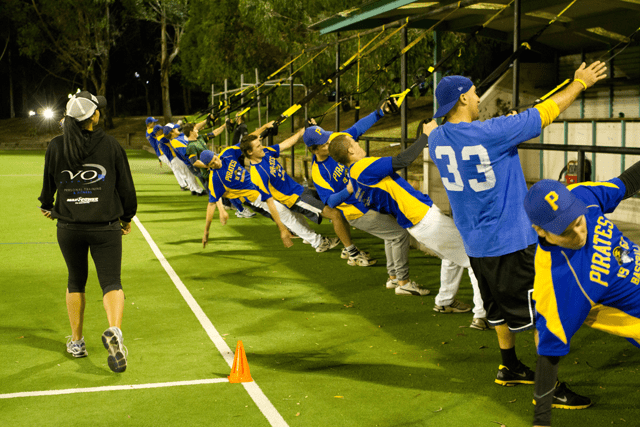 VO2 Vitality uses the TRX Suspension Trainer and the TRX Rip Trainer with the “Northern Pirates” baseball team, who are now Illawarra Baseball League 2011 Club Champions. This has eluded the team for past 17 years. Other clients using the TRX Suspension Trainer & TRX Rip Trainer is Nicholas Squires and Skye Burgees who are both competing on the World Qualifying Series for surfing. They also have Scott Brown who is competing on the National Moto Cross Circuit. Brendan is a TRX instructor and Group instructor with VO2 Vitality. He is a Level 1 Strength and Conditioning Coach, a Level 2 Kettlebell Instructor and a Punchfit Kickboxing Instructor. He also has 6 years of Kyokushin Karate and 3 years of kickboxing with both State & National Titles wins.